Robots and robotics are everywhere in STEAM education, it seems. We know kids like them. But how can educators tie robotics to class curriculum, as opposed to watching students operate the controls to send robots across the room? That’s one of the questions likely to be answered over the next seven months during the 2017-18 STEAM work group series, which starts Oct. 26 and continues monthly through May. The free workshop is for local leaders in STEAM education who would like to share, learn and promote what they and others are doing around the county. All meetings will be at the Douglas Education Service District and are tentatively set to take place from 4:15 to 5:45 p.m. The work group series is funded by the Umpqua Valley STEAM Hub, which is coordinating the effort with Douglas ESD. To ensure lessons match participant needs, the STEAM work group series is limiting session sizes to eight to 13 members, or about one per school district. Each workshop will led by a different member, who will share insights and expertise with the group. The idea is to target “teacher leaders” at each school who can feel comfortable coming together on the same level to exchange ideas, said Ryan Zeedyk, Douglas ESD instructional technology specialist. As STEAM education receives more emphasis nationwide, some school districts and regions are finding themselves scrambling to catch up. Zeedyk said Douglas County already has made solid progress on many fronts. Educators here already have participated in workshops focused on science curriculum adopted by the state last year, as well as attending trainings geared to meeting federal Next Generation Science Standards. Each of these areas include engineering concepts as part of the instruction. In addition, Zeedyk said, Douglas ESD has offered technology workshops for teachers for the past four years. Many county educators also are familiar with project-based learning, a student-initiated model aligned with the direction in which national education as a whole is moving, Zeedyk said. Organizers envision that the 2017-18 STEAM work group will keep the momentum going. 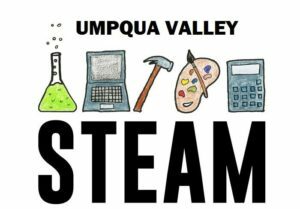 Using materials borrowed from the Umpqua Valley STEAM Hub’s resource library, as well as other sources, educators can plan agendas for the monthly sessions that are most helpful to group members. With robotics, for example, teachers may explore how they can integrate math into class activities, or how to collect data for science projects while coding. “Someone might say, ‘I want to record myself doing a lesson and get ideas from you on feedback.’ Or one session could be, ‘I wrote this NGSS lesson plan; let’s dissect it together and practice it,’” Zeedyk said. Click here for details such as the tentative monthly schedule and a link to registration.